« Happy Hour, Happy Anniversary, Happy National Margarita Day! March rolled around like it does every year and my birthday, as it always does, rolled right around with it. And I love my birthday. The thing about getting older is it happens every day, every second of every day really. So anyone can get up any morning to take stock of a new life wrinkle. Like is that jiggle in the middle the result of cortisol or carbs and should you try a belly diet and sit ups or just get a good set of Spanx? Is there an age limit on short skirts and black nail polish? Does anyone really notice a few grey hairs? On any day, you can contort to see your straightened elbows in the mirror and wonder if that extra skin was always there or if it’s new (after all, even kids need some skin slack for elbow bending, right)? You can set aside every other Thursday to check how far your knees have fallen (I like to look down at them while standing and lay in bed with my feet toward the ceiling to account for all angles and gravitational pull). Alternate Tuesdays are useful for deciding when youthful smile lines cross over into new territory. Save Sundays for bigger issues like deciding if Botox makes people look weird and if at any point you’d get “just a little work” done. It’s true a birthday is the formal rolling over of the calendar. But considering the endless opportunities for age fixation and anxiety of all types, I prefer to set my Birthday aside for flat-out adulation. It would be nice if, as a matter of course, people applaud when I enter a room (Apple is on the right track. I was waiting outside the locked door one morning, tucked in the entry way to get out of the rain. When the staff flooded upstairs from their morning meeting and opened the doors, they clapped the eager patrons into the store. I blushed, I giggled, I bowed. I’m thinking of setting up weekly Genius Bar appointments.) I’m open to regular high fives, thumbs up, hugs, googly adoring eyes and “atta girls”. The thing is, taking care of the business of living is time-consuming so I understand that friends and family can’t make it to the florist for rose petals to sprinkle at my feet as I walk down the street. It seems to me that a birthday is a natural day for the people who love you to tell you. So for any of you who are prone to hear the ticking of the clock louder on your birthday than other days, here are a few reasons to love the day. 1. Cake. Birthday Cake. Birthday Cake is awesome and let’s face it, underrated. My mother used to make me doll cakes. She’d bake a cake in a bowl to and flip it to form the skirt. Then she’d stick a Barbie into the center and decorate the cake and Barbie with frosting so I’d have a beautiful princess ball gown cake. 2. Presents. I know after a certain age, it’s not cool to admit you like presents but, I do. Pretty packages, bags and bows and the wonder and anticipation when you don’t know what’s inside. How great is it that someone is willing to shop on your behalf? 3. Unofficial Vacation. Even if you’re in the office on your birthday, you don’t do any work. It takes all your time to field birthday calls and emails and texts. And how cool is it when someone unexpected reaches out across time and distance? 4. Silliness. Singing cards, funny gifts, party games. Birthdays put people on a mission for fun and you never know how it’s going to come out. 5. Love. I think every “Happy Birthday” wish is love since the real message comes down to people are happy you were born. How great is that? 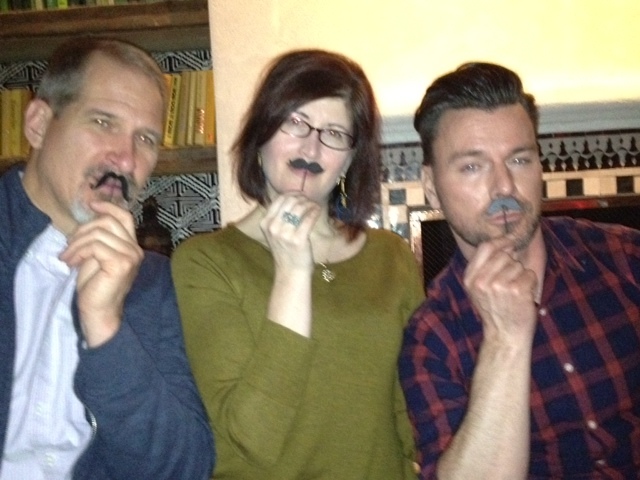 My birthday filled with love in the form of great family, friends, fun, margaritas and tacos (and fake moustaches) at Salvation Taco. Salvation Taco is brand new so they haven’t celebrated their first birthday yet but they were excellent at celebrating mine. 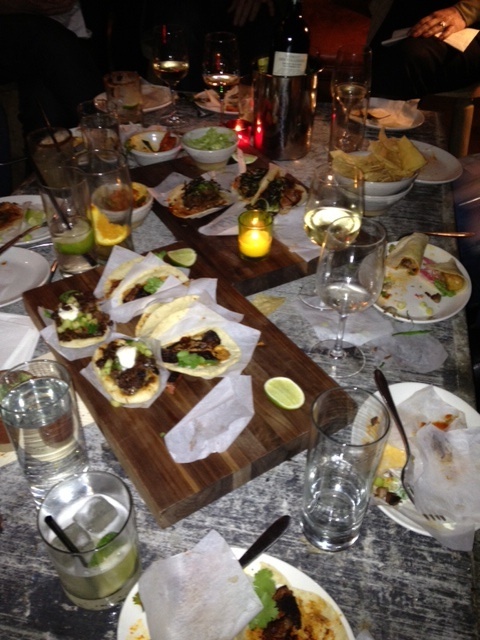 One of my New England Correspondents says he’s up for eating one or three lamb tacos per day. The fish are my favorite and let’s not forget Al Pastor or Skirt Steak or Korean BBQ. Yes, all tacos, all yummy. 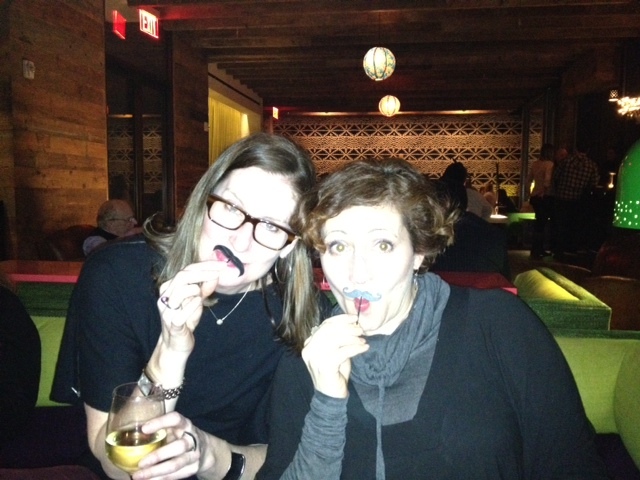 And what party would be complete without fake moustaches? I’m not sure how I ended up with a dentist who is younger than I am when it doesn’t seem like that long ago that my dentist had decades on me and my young brain didn’t recognize any years before my birth. And sometimes when I’m walking down the street watching people instead of my feet, I try to figure out when I lost the ability to figure out if someone is 13 or 23. But, none of this matters because I know how much I’m loved (and I believe recent schooling makes up for my dentist’s relative inexperience). Today is my mom’s birthday. I’m pretty sure she questions how she has a dentist younger than she is and I’m also positive she embraces the 5 Reasons Birthdays Are Awesome. When I called her this morning to wish her well she said that she remembers what she was doing on this day after I was born. She was cuddling me. Mom, Happy Birthday! And thanks for all the cuddles and love in all forms (especially doll cakes) and thanks for the great skin. (My mom was kind enough to pass on good skin genes so wrinkes are, in fact, one age worry I get to strike from my list). Henceforth will endeavor to have a “(margarita) glass half-full” attitude towards personal birthdays! Delighted to celebrate YOURS, of course (yum, Salvation Taco). Thank you for the post — the mustache picture might be the best photo of me ever! Yes, the idea that women can’t sport a stach in style is completely outdated. Thank you for the very excellent gift! !